Accurate indoor localization has the potential to transform the way people navigate indoors in a similar way that GPS transformed the way people navigate outdoors. 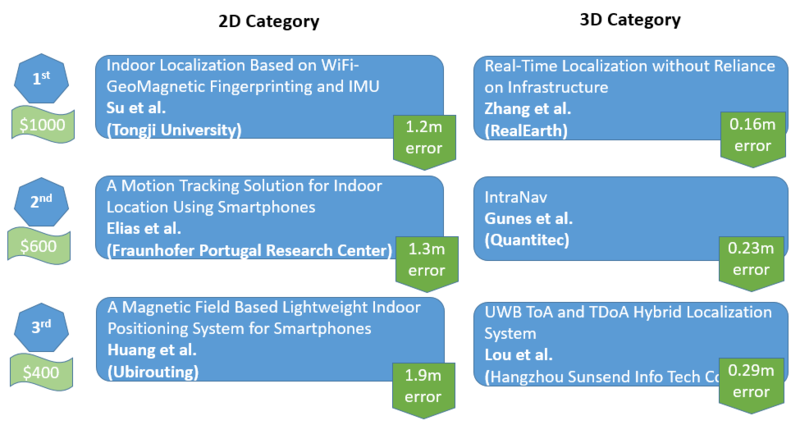 Over the last 15 years, several indoor localization technologies have been proposed and experimented by both academia and industry, but we have yet to see large scale deployments. This competition aims to bring together real-time or near real-time indoor location technologies and compare their performance in the same space. 04/15/2016: The official results of the 2016 competition have been announced. An overview of the results can be found HERE. The detailed results for all teams can be found HERE. Congratulations to all the teams that participated! 04/04/2016: The competition’s detailed schedule has been announced. All registered teams have been assigned a 15min evaluation time slot on Monday April 11th, 2016. 03/17/2016: Details about registration, evaluation area, and various logistics can be found HERE. 03/16/2016: The competition will take place on Sunday April 10th, and Monday April 11th. The results will be officially announced on Tuesday April 12th (currently working to move the announcement from Wednesday April 13th as listed on the official program to Tuesday April 12th). 02/19/2016: the registration for this year’s competition is currently open: http://www.cpsweek.org/2016/reg.html. All contestants planning to attend the competition must officially register for the competition! Registration for the IPSN conference is NOT required. 02/11/2016: the teams participating in this year’s competition along with the competition categories have been announced! 02/11/2016: We have received 49 submissions this year! The competition is on! 10/20/2015: The 2016 Microsoft Indoor Localization Competition has been officially announced! Check the 2015 and 2014 competition websites above to get a better idea of the evaluation setup, the type of systems expected, and pictures of the different teams in action! The detailed results can be found HERE and HERE. The team from JRC that performed the ground truth mapping of the evaluation area has made the 3D scanning data available. For more information on the collected 3D scanning dataset you can contact Simone Ceriani and Pierluigi Taddei. Marinis et al. in the 2D category was not considered for the awards. The system required a significantly different evaluation process compared to the official one. The team required to go over specific evaluation points multiple times, and to also record the exact evaluation point they were at, at any given time. Given that no other teams followed this process, this team was not included in the awards. Elias et al. 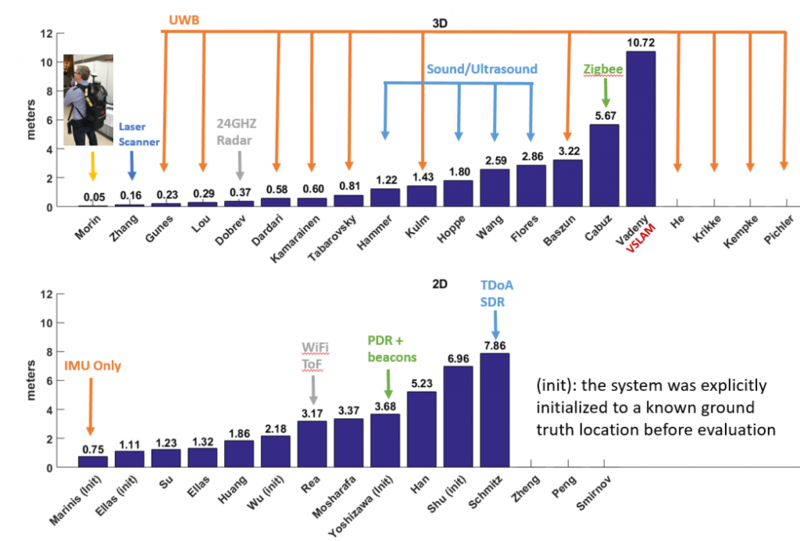 competed with two versions of the same system: one that requires explicit initialization to a known ground truth location before the evaluation, and one where the initial location was automatically inferred by the system based on WiFi and magnetic fingerprints. Both versions of the system complied to the rules of the competition, and the version of the system with initialization clearly achieved the lowest error. However, given that the system from Su et al. that achieved very similar accuracy to that of Elias et al. did not use explicit initialization, we believe that a fair comparison can only be made among the Elias et al. without initialization and the rest of the teams. Given this, Su et al. got the first place, and Elias et al. the second place. Given the technology leveraged by both teams, the achieved accuracy by these teams is practically identical. Morin et al. in the 3D category was an exhibition team from the competition’s sponsor Leica. They used a backpack equipped with 5 high-end camera modules, 2 LIDARs and a commercial-grade GPS receiver. This system was not a real-time system as they had to post-process image data and manually select the evaluation points in these images. As a result, it was not considered for the awards. Flores et al. in the 3D category: during the evaluation process, the organizers wrote down the wrong x-coordinate for evaluation point 15. Even though the team reported (13.38, 0.44, 3.65), the organizers wrote down (30.38, 0.44, 3.65). With this correction, the average location error for this team is 1.74m and not 2.86m. Kulm et al. in the 3D category reported coordinates without adjusting for their 1.5m tall tripod they used to attach their tag to. Unfortunately, they informed the organizers about this after the competition was completed. When adjusting for the 1.5m fixed offset of the tripod, the location error of this team comes down to 0.43m from the 1.43m shown in the graphs above. We are happy to announce we have received 49 submissions this year! All 49 submissions have been classified into two categories: 3D and 2D localization. All 27 teams in the 3D localization category require to deploy custom hardware, and will have to provide 3D locations during evaluation. All 22 teams in the 2D localization category rely on already available signals such as WiFi and FM, and will have to report 2D locations during evaluation. Teams in green fonts have at least one team member officially registered for the competition, and will be allowed to deploy their systems during the competition. Teams in red fonts do not have any of their team members officially registered, and therefore they will NOT be allowed to deploy their systems during the competition. (based on registration data as of Monday March 21st). Monday:04/11/2016 (Evaluation Day) 8:30 – 17:30 Evaluation of all teams in 15min pre-assigned time slots. Teams should be present at least 1.5 hours before their assigned evaluation time slot. The time slots assigned to each team can be found in the two tables below. Tuesday:04/12/2016 Official Results Announcement 14:30 – 15:30 The official results are announced. Winning teams give 5min talks describing their systems. This session will be held in the same room where the IPSN 2016 conference will take place here. Both academia and industry submissions are encouraged. All location techniques, such as ranging, fingerprinting, infrastructure, or device free, are welcome, except those that require end users’ manual measurements. Contesters can deploy their own infrastructure of up to 5 devices. Normal RF interference is expected, but no jammers from other deployments are allowed. The results must be shown on a portable device, such as a phone or a tablet/laptop that a person can easily carry around. Depending on the nature and number of submissions multiple categories might be defined based on the accuracy (i.e., point-based vs. area based), the size, the cost, or the type (i.e., software vs. hardware) of the proposed solution. Commercial off-the-shelf (COTS) Technologies: Submissions in this category should be able to work with unmodified commercial off-the-shelf devices such as laptops, phones, and tablets. In this category, the unmodified COTS device is localized. Teams in this category will not be allowed to interface any custom hardware to the COTS devices (i.e., UWB or ultrasound hardware). Only changes to the software of the devices will be allowed. Submissions in this category could be further classified to infrastructure-based and infrastructure-free depending on their requirement to deploy custom hardware (i.e., BLE beacons) in the evaluation area. Commercial off-the-shelf (COTS) Technologies with Initialization: Submissions in this category should meet all the criteria of the COTS Technologies category, with the additional requirement to initialize the location of the COTS device being localized to a ground truth location before the evaluation. Modified Commercial off-the-shelf (COTS) Technologies: Submissions in this category could interface custom hardware to the COTS devices to be localized (i.e., UWB or ultrasound hardware). Submissions in this category could be further classified to infrastructure-based and infrastructure-free depending on their requirement to deploy custom hardware (i.e., BLE beacons) in the evaluation area. Most, if not all, submissions in this category are expected to be infrastructure-based. WiFi fingerprinting approaches that also leverage inertial sensors will be classified as infrastructure-free COTS Technologies as they do not require to interface any custom hardware to the COTS device being localized. WiFi fingerprinting approaches that also deploy custom BLE beacons in the evaluation area will be classified as infrastructure-based COTS Technologies as they don’t modify the COTS device being localized, but they require the deployment of custom hardware. Approaches based on inertial sensing that require to be initialized to a ground truth location before being evaluated will be classified as COTS Technologies with Initialization. UWB approaches will be classified as infrastructure-based modified COTS Technologies as they require modifications to the COTS device being localized, and they need to deploy custom hardware in the evaluation area. In the past, teams were asked to report 2D locations (X,Y). In this year’s competition, teams will be required to report 3D locations (X,Y,Z). The evaluation area we have reserved, even though it does not contain multiple floors, it includes locations with different elevation characteristics. On top of that, we plan to place the devices to be localized at different heights during the competition to evaluate the 3D localization accuracy of each team. Not all teams will have to report 3D locations. We understand that some technologies are not suited for 3D localization (i.e., WiFi/geo-magnetic fingerprinting, dead reckoning, BLE-based etc. ), but they are still excellent candidates for commercial indoor location systems. With this in mind, the organizers will determine shortly after the registration deadline which teams will be classified as 3D localization teams. It is not up to the individual teams to decide if they will report 2D or 3D locations. The organizers will ensure that all the teams in a given category will either report 2D or 3D locations. There will be no categories containing both 2D and 3D localization teams. Results are judged based on accuracy, and an award will be given to the top 3 teams in each category. When accuracy ties, infrastructure requirements will be used for tie breaking. The winning teams in each category will be invited to present their approach at the conference, and receive a cash award. The exact accuracy metrics that will be used during evaluation will be announced shortly before the competition takes place. Contesters must submit an abstract describing their approach and deployment requirements by the contest registration deadline. Submissions are treated as confidential until the competition. Submissions must be at most two (2) single-spaced 8.5″ x 11″ pages, including figures, tables, and references. Submission should follow the exact same format as regular, full IPSN 2016 papers. Abstracts should include the names and affiliations of all authors. Templates can be found here.